First, Callie lost her parents. Then she lost her home. And, finally, she lost her body. But she will stop at nothing to get it back ...Callie and her little brother are on the run, living as squatters, fighting off unclaimed renegades who would kill for a cookie. But with the Body Bank comes a promise of much-needed cash, and with it, hope. And then despair ...The Bank allows teenagers to rent out their bodies to those who want to be young again. But Callie's renter intends to do more than party in her body. She intends to murder .. Loved this. 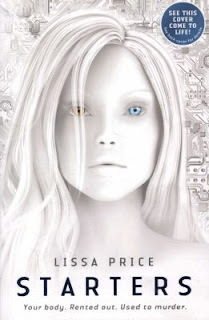 Seriously, can NOT wait for the sequel, Enders, to come out :) It is a little sci-fi and probably the one I've enjoyed most since The Host (not including all the In Death series books ... I hardly consider them sci-Fi although I guess technically they are set 50yrs in the future). This sounds really interesting, thanks for giving me a link to your post. I'm going on leave in about a week's time and I really need to catch up on my reading if I'm going to reach my goal of 100 books in 2013 - this sounds right up my alley.